Updated on 08-07-2014 by Williams Pelegrin: Alas, this appears to be a fake. Nothing to see here, folks! Pebble was one of the first smartwatches to arrive on the scene and it is still one of the most popular wearables out there. Even though Pebble doesn’t have a fancy color display or several other bells and whistles that you’ll find on the new Android Wear smartwatches and Samsung’s Tizen-based devices, its long battery life, great apps, and easy-to-use interface make it one of the best smartwatches hands down. The main gripe that most Pebble users have with the smartwatch is the lack of color display. While some users say they don’t want a color display because it will eat up the battery, others are still hopeful that Pebble will find a way to add one without compromising the battery life too much. Now, fans of the color display may get what they’ve been waiting for. German website Mobile Geeks received a tip from one of its readers that included a PDF directly from Pebble with a rendered image of a Pebble smartwatch, featuring a color display right in the middle of the document. 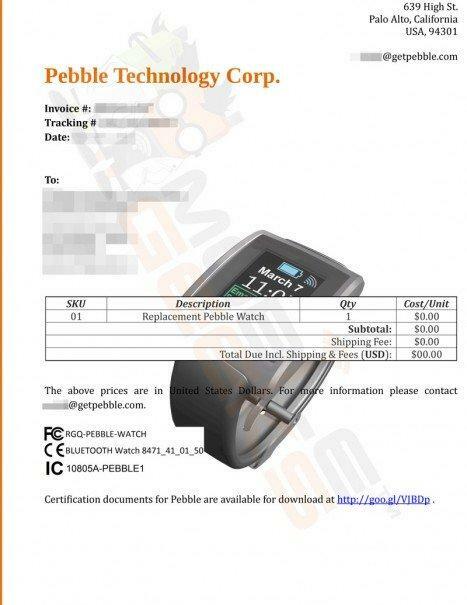 The site says that the document is an invoice from Pebble that was sent to a European customer who had sent his first-generation Pebble smartwatch back to be replaced, due to a serious defect. The image shows a standard Pebble smartwatch with one major difference: a color screen. The pops of color only appear in a few key places, such as the battery, Wi-Fi signal, and notification box. The rest of the display is black and white. Based on the PDF alone, it’s hard to tell whether the image is of a new, full-color Pebble smartwatch that has yet to be revealed or if it’s just an illustration to make the bill look more appealing. However, it’s entirely possible that Pebble will add a color display to its next smartwatch. It could even be a Mirasol display like the one Qualcomm uses on the Toq smartwtach. At this point it’s impossible to tell whether the image is real or not.